The main impetus for using a lab with a one-way mirror is being able to invite designers, investors, and engineers to observe how participants react to products and services. Since the early 1970s, professions such as user experience, market research, advertising, and law enforcement have been using rooms that have one-way mirrors—like the one shown in Figure 1—to enable direct observation of research participants—and suspects. For both user experience and market research, the main impetus for using a lab with a one-way mirror is being able to invite designers, investors, and engineers to observe how participants react to products and services. We’ve worked with quite a few clients who felt that this is the only way to do user research. But, in reality, observing participants through a one-way mirror is just one of many approaches to research and, like all approaches, has its advantages and disadvantages. In this column, we’ll outline the challenges of using labs with one-way mirrors, share user feedback on such labs, and offer effective alternatives from current practice. There is a phenomenon called the observer effect, which refers to how observation changes the object or person being observed. … This is a major concern for user research and focus groups that are conducted in labs with one-way mirrors. In the fields of physics, psychology, and biology, there is a phenomenon called the observer effect, which refers to how observation changes the object or person being observed. For example, taking pictures or videos of a tribal culture that has never experienced such technology introduces new concepts into the society and fundamentally changes their behavior, because this is not a natural experience they would normally encounter during their daily lives. This is a major concern for user research and focus groups that are conducted in labs with one-way mirrors. When you place people in an environment where they sense they are being observed, their behavior changes. These changes in behavior can drastically affect your ability to accurately understand how your target market feels about your product or service. In our experience, people tend to focus on positive responses and have a very difficult time being completely open and honest about their thoughts and feelings. One of our primary goals when conducting research is to make participants feel extremely comfortable. One of the ways we do this is by taking a little time to get to know participants and enable them feel that they know us a little, too. To minimize the impacts of observation on research, we emphasize the need for honest feedback and also reassure participants that we are not actively watching or evaluating them; rather, we are evaluating the product and taking notes and listening to their comments to enable us to improve the product. What we have found creates the most anxiety for participants is the idea that hidden strangers are staring at them through a window. The perfect example is when participants try to complete a series of challenging tasks as part of a usability test. It is easy to see their level of frustration rise as they work through the tasks—while repeatedly glancing at the mirror. The feedback we tend to get about one-way mirrors is that they are scary, intimidating, nerve racking, and uncomfortable. We’ve had the opportunity to work with thousands of participants, and the feedback we tend to get about one-way mirrors is that they are scary, intimidating, nerve racking, and uncomfortable. In one case, when we asked a participant about the one-way mirror, she responded: “I could just feel everyone watching me, and it made me feel dumb for having such a hard time.” This type of feedback is worrisome because users may not be fully expressing their thoughts about the product. They become distracted by the feeling of being watched when they make mistakes rather than remainingve focused on improving the product by providing thoughtful feedback. In almost every case, participants were in a very nice room with comfortable couches and chairs, and we had provided them with food and beverages. You might think they would walk away from the experience with a feeling of satisfaction and excitement, considering they had just had the opportunity to get a look at a new product or service. Unfortunately, the mere fact that these people feel like they are being watched changes their overall experience. We took a deeper look into these anecdotal findings and asked a few research participants more detailed questions about their experience with one-way mirrors, and this is what we found out. Once participants walk into a room and see a one-way mirror, they believe there is a certain way they need to act, a certain way they need to respond to questions; and they feel that they need to do things correctly. The only way we’ve been able to mitigate these feelings is to talk through them and reassure participants that we’re using the room only so we can tape the session, enabling further review. Since we know, in general, what feelings people tend to have when sitting in a lab with a one-way mirror, we try to address them immediately, as best as we can, and are able to put some of them to rest. Don’t let participants sit facing the mirror…. Discuss the elephant in the room and point out the two-way mirror, explain why you are using it, and address any concerns a participant may have about it. Talk with participants for a few minutes before a session and help them relax. Ask about their day or their work. It’s best to quickly build friendly feelings with participants to help them relax and feel more comfortable with the situation. Wear clothes that are similar to what participants are likely to wear to a session—perhaps jeans and a casual top. If you look like a psychologist or evaluator, that can make participants nervous and less likely to open up. We find that, when you blend in, you build rapport faster and get more honest feedback. Don’t let participants sit facing the mirror—have them sit to the side, facing away from the mirror, or if possible, with their back to the mirror. There is nothing more nerve racking than staring at a mirror for an hour when trying out a new product. 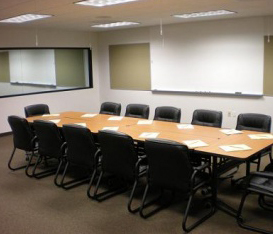 If possible, moderate sessions from within the room with participants. Providing participants with instructions and asking them questions face to face helps them to forget about the mirror and focus on the person in front of them rather than on a disembodied voice coming over the speakers. Finally, don’t act like you are formally examining participants. Act casually and treat participants as if you are working with them, not just watching them. For example, when you ask participants questions about their feedback on a product, have someone else take notes, so you can have a normal conversation with them, and they can focus on you the whole time. We find this method very helpful, because it frees up a researcher to ask lots of follow-up questions and focus deeply on what participants are saying in the moment. There are a few alternatives to using a lab with a one-way mirror that have proven successful in alleviating the uncomfortable feelings participants endure in such a situation. Rather than using a one-way mirror, install an overhead camera and put observers in a room down the hall. Participants tend to forget about cameras, but have a hard time becoming habituated to a large, mirrored wall. Bring participants into an office setting and conduct sessions in front of team members working at their desks. This may sound like a stressful environment for participants, but when they see everyone working and just going on with their business, they tend to relax and feel part of the team. This is an excellent opportunity for a team member to take notes, because participants won’t be paying attention to what everyone else around them is doing. Visit participants in their own environment—whether their home, business, or a local coffee shop. By doing this, you alleviate the stress of participants’ being outside their usual environment. In this case, you can use Web video services to stream sessions to observers and also tape sessions for future review. More realistic behavior tends to be prevalent when participants are in their own environment. Remote sessions are becoming more and more common and involve participants’ using their own computer to connect with a moderator and working through a test scenario or responding to questions like those typically asked in focus groups. This option is less personal, but allows participants to be in a setting that is comfortable for them. Plus, it creates an interpersonal disconnect that typically leads to increased confidence and honesty. Ultimately, our goal is to ensure that participants are comfortable, understand their role in our design projects, and provide the best product feedback possible. There are many ways in which we can conduct user research—using a one-way mirror is just one option. Although we do not think doing research in a lab with a two-way mirror is always the best option in all situations, we do think it can provide value in certain situations—especially if you follow best practices and give the proper attention to the needs of participants. But, in this column, we wanted to point out that there are alternatives to using a lab with a one-way mirror that have worked well for us over the years. Ultimately, our goal is to ensure that participants are comfortable, understand their role in our design projects, and provide the best product feedback possible. We would love to hear your thoughts about this. Have participants given you any interesting feedback on how they feel about their experience of being in a lab with a one-way mirror? Let us know! For the record: You might be interested in the history of thinking behind the focus group. “… and was introduced in Michael Sommer’s, “Open Systems Listening: Conversation As a Research Tool,” PhD Dissertation, 1988, regarding paradoxical communication / environment of inquiry (Listening Post: cognitive research methodology for group—external dialogue).